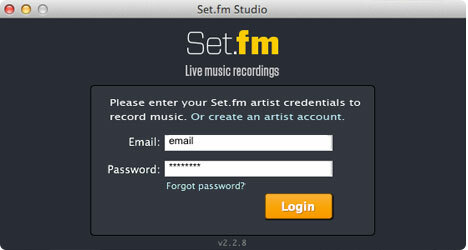 Set.fm Studio is our custom recording app that enables you to sign in, record, and upload/publish recordings. 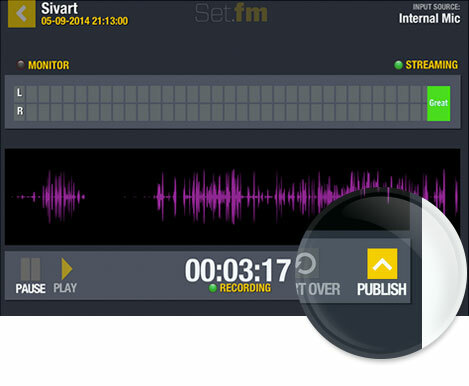 Set.fm Studio can be installed on mobile iOS devices, and computers running Windows or Mac OS X. A mobile version of the Set.fm Studio app is available for iPhone or iPad. 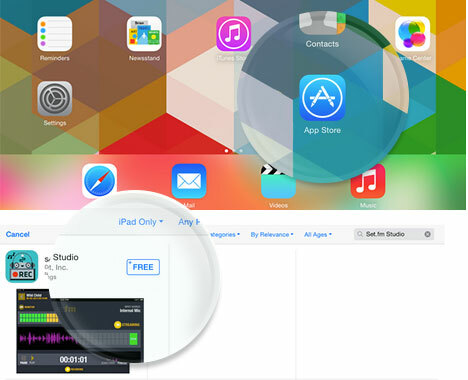 The Studio app can be downloaded for free from the Apple App Store. Search for Set.fm or follow the link on the Software Download page. Set.fm Studio for iOS can be installed directly from Apple’s App Store. First, launch the App Store from your iPhone, iPad, or iPod Touch. 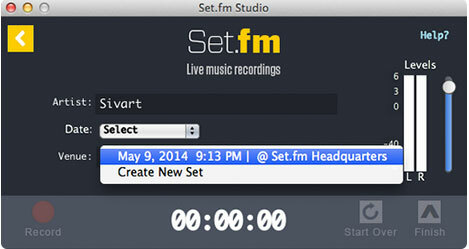 Then, search for “Set.fm Studio” and tap the install button (“+FREE”). When you first launch Set.fm Studio, you’ll be prompted for the email address and password associated with your Artist account. Enter your email and password and tap “Login”. Select the set/date under “Available For Recording” section. Before a set is available to record against, you must first create it through the website. Make sure that your recording levels are not too high: avoid “Peak” levels. Tap the red circle to begin recording. You can pause the recording at any time or tap “Start Over” to erase the entire recording. Tap “Publish” to upload and publish your recording to Set.fm. Desktop apps are available for both Mac and PC platforms. You can download a copy of the Set.fm Studio app for free on the Software Download page. 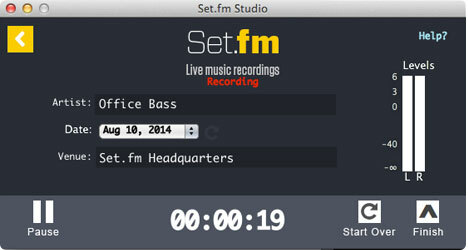 Set.fm Studio for Windows and Mac can be installed from the installer package available on our website. Visit our dedicated Studio Set.fm Downloads page by clicking About then Software Download on our homepage for installation instructions. On the desktop application select a date from the Date pop-up menu. Select a set you've created earlier or choose the "creat new set" option. Make sure that your recording levels are not too high: avoid “Peak” levels. Click the red circle to begin recording. You can pause the recording at any time or click “Start Over” to erase the entire recording. Click “Finish” then click “Save” to upload the recording to Set.fm, then click “Publish” to publish the recording and make it available for purchase. If you’re comfortable with using Digital Audio Workstations (DAW), such as Logic or GarageBand, you can use the Set.fm Studio effect plug-ins instead of the standalone application. By using the Set.fm Studio plug-in you can record and upload/publish a set in any DAW that accepts Audio Units or VSTs. Templates for selected DAWs are also provided in the Set.fm Studio installer so you can easily create a project with the Set.fm Studio plug-in ready to go.